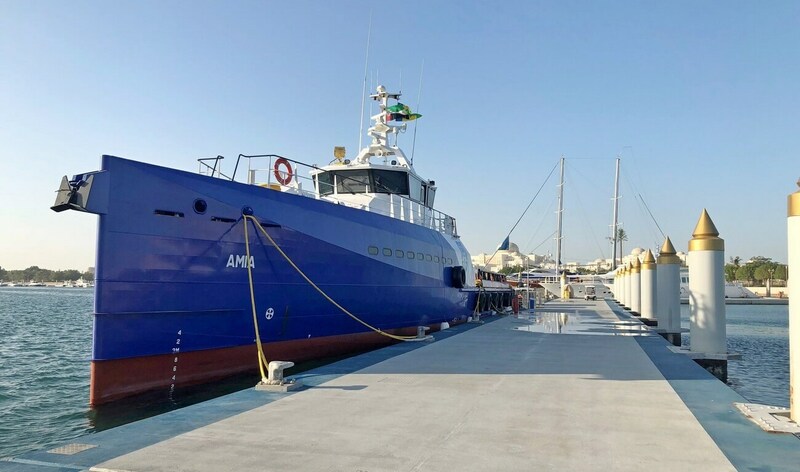 Home › Crew Supply Vessel › Fast Crew Supplier › Fast Crew Supplier 4008 › Fast Crew Supplier 4008 "AMIA"
Damen Shipyards Group has delivered its first vessels to Marine Core & Charter LLC (MC2), a marine services company supporting the offshore energy sector in the Arabian Gulf. The second FCS 4008, named AMIA was officially handed over at a ceremony held at the Emirates Palace Marina in Abu Dhabi on the 23rd of November. AMIA is fitted with seating for 90 personnel, has a top speed of 25 knots and a range of 1200 nautical miles. This gives her the ability to reach even the furthest offshore installations. 140 square metres of cargo deck aft enable her to carry containers and a wide range of other equipment. Damen’s famous Axe Bow design delivers excellent seakeeping in a wide range of weather conditions, ensuring that personnel arrive at their destinations ready for work.